Last Updated: July 13, 2017 | Subscribe to our weekly newsletter! When’s the last time you cleaned your pool? We mean really cleaned it. Could it be that your pool is in need of a good scrubbing right now, and you’ve been putting it off because—let’s be honest—cleaning the pool isn’t nearly as fun as swimming in it? Look, we all slack off from time to time. We’re human. But here’s the thing: if you’re not cleaning your pool on a regular basis—and the right way—there will come a day, sooner rather than later, that you simply can’t swim in your pool because it’s too dirty. And then what’s left? Running through the sprinkler? 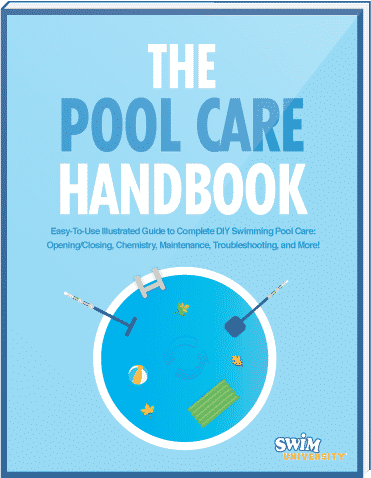 There’s a reason cleaning is one of our 3 Cs of pool care along with circulation, and chemistry. With the right equipment and a little elbow grease, you can skim, brush, and vacuum your way to a sparkling clean pool in no time. Why Do You Need to Clean Your Pool? 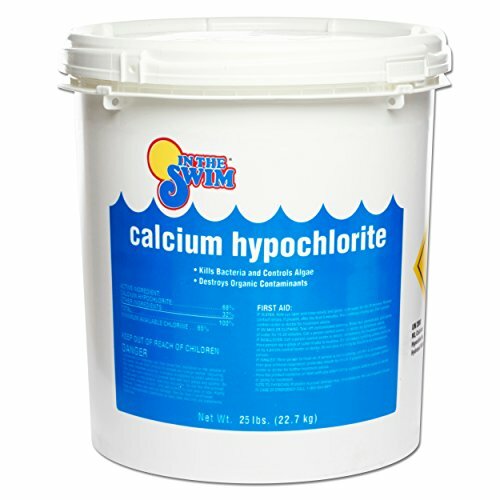 Right now you’re probably thinking, why do I have to bother with scrubbing or cleaning my pool when I add chlorine If you click this link and make a purchase, we earn a commission at no additional cost to you. or other sanitizing chemicals to the water? It’s a valid question, and we have an answer. Think of it this way. When you shower, you use shampoo and soap, which are cleaning agents. But does your tub stay clean indefinitely? Of course not. Shampoo and soap are meant to clean your body, not tile, porcelain, or fiberglass. After a while, you’ll start to see buildup and icky soap scum. And then, because your tub and shower walls stay wet much of the time, it’s possible mold will start to grow in there. If you don’t clean your tub regularly, you’ll be trying to bathe in a swamp after a while. Won’t that be fun?! It’s the same for your pool. Chlorine, bromine If you click this link and make a purchase, we earn a commission at no additional cost to you. , and other chemicals help keep your water clean and yes, to a degree, they also help keep the walls, floor, and surrounding areas of your pool clean too. But chemicals won’t keep leaves and bugs out of your water, nor will they keep the walls and floor of your pool clean indefinitely. So no excuses. In addition to using chlorine or other chemicals to keep your pool clean, regular, thorough cleaning is also absolutely necessary. Before you get started, you’ll want to make sure you have all the necessary tools on hand. Having the tools you need will make pool cleaning much easier on you. And if it’s easier, you’ll be more apt to do it more often. Come on, you know it’s true. So head out to your pool shed and take inventory. First, inspect the tools you already have. Are they still in good shape? Or do you need new ones? Next, take note of what’s missing from your collection. What do you need to add? And if you’re a new pool owner, maybe you’re just not entirely sure what pool cleaning equipment you need. Don’t worry—we’ve got you covered. Ah, the Swiss Army knife of pool cleaning. You can attach all kinds of things to the end of a telescopic pole If you click this link and make a purchase, we earn a commission at no additional cost to you. . Skimmer nets, brushes, vacuum heads, puppets for a pool puppet show. Just a suggestion. As its name suggests, a telescopic pole can be extended to different lengths. We recommend buying an 8-foot pole that extends to 16 feet. That should allow you to clean the walls and the floor of the pool when necessary. This is one of the tools you’ll probably use more often than any other. Attached to a telescopic pole, a skimmer net If you click this link and make a purchase, we earn a commission at no additional cost to you. allows you to collect debris that’s accumulated on and below the water’s surface. Leaves, bugs, twigs, hair ties—all of them can be scooped up in a skimmer net. You have two options when choosing a skimmer net: a flat skimmer, or a bag skimmer. We recommend the flat skimmer because it’s easier to shake off the debris you collect from the pool. While a bag skimmer may hold more, it’s a pain to empty, especially when it’s wet. Also, buy a heavy-duty skimmer net. As is true with almost everything, cheaper ones tend to break often, and you’ll just be wasting money by having to buy skimmer nets all season long, year after year. Here’s where you can stop a problem before it starts. To prevent debris from sinking to the bottom of your pool, skim the water daily. This will also make vacuuming easier. Break out that telescopic pole again. Once you attach a pool brush If you click this link and make a purchase, we earn a commission at no additional cost to you. to it, you can scrub your pool’s walls and floor, removing dirt, and detaching algae before it can really take hold and grow. But what kind of pool brush should you use? In order to answer that question, we must ask another: What is your pool surface made of? The type of material will determine the type of brush. Unpainted Concrete: Use a brush with both stainless steel and nylon If you click this link and make a purchase, we earn a commission at no additional cost to you. bristles. 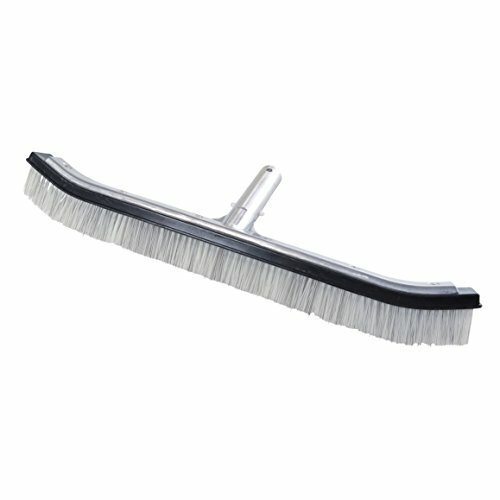 Gunite: Use a brush with stainless steel bristles If you click this link and make a purchase, we earn a commission at no additional cost to you. .
Fiberglass, Vinyl, or Painted Concrete: Use a brush with nylon bristles If you click this link and make a purchase, we earn a commission at no additional cost to you. only. Just like skimmer nets, it’s wise to purchase a heavy-duty pool brush since you’ll be using it frequently, and cheaper brushes tend to break due to, well, cheapness, but also the frequent exposure to pool chemicals. At least twice a week, brush the walls, ladders, and corners of your pool. Be sure to get into every nook and cranny possible to brush away any lurking algae formations. Brushing will push the algae into the water, making it easier for chlorine or other sanitizer to kill it. Note that if your pool has developed a serious algae problem, brushing isn’t going to remedy it. You’ll need to take more drastic steps to get rid of pool algae. What’s the first thing you’ll need? You guessed it—the good ol’ telescopic pole. Maybe you should get a couple of those If you click this link and make a purchase, we earn a commission at no additional cost to you. , huh? Then add just a few more things: a vacuum head If you click this link and make a purchase, we earn a commission at no additional cost to you. ; a vacuum hose If you click this link and make a purchase, we earn a commission at no additional cost to you. 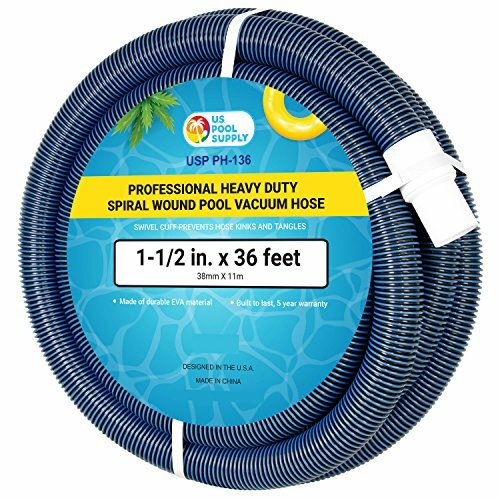 long enough to reach every part of the pool; and a skim vac If you click this link and make a purchase, we earn a commission at no additional cost to you. or vacuum plate (if needed). Unless it’s warranted more often, it should be enough to vacuum your pool about every other day. Note that vacuuming a pool manually can be pretty labor-intensive, especially if, say, you’re cleaning the pool after a big thunderstorm, and your pool floor looks like a forest of leaves. There may be times when a manual vacuum can come in handy, but we highly recommend you consider investing in a robotic vacuum to make your life easier. What’s this? 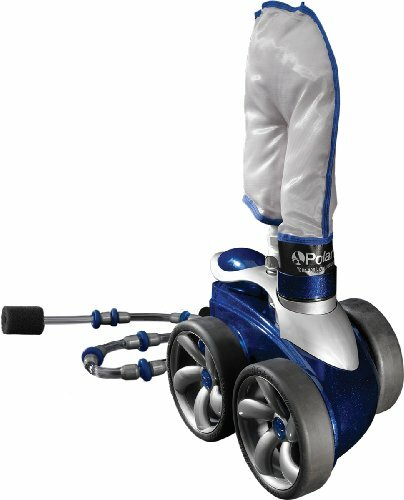 A robot that will clean your pool for you? Yes, please! OK, it can’t do all the cleaning, but it can sure do a lot of it. 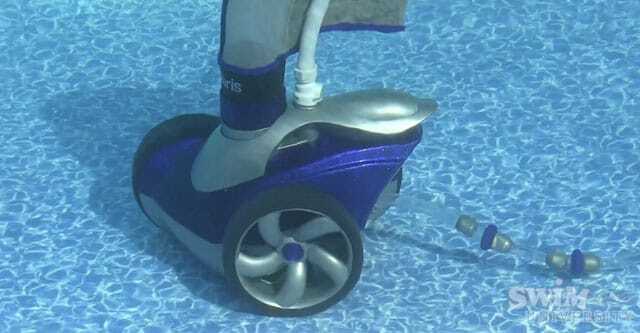 If you’ve never seen one, a robotic pool cleaner—also called an automatic pool cleaner—is a small, self-contained unit that essentially drives around your pool sucking up debris while you sit poolside, sipping a cocktail. The only downside to a robotic vacuum is the cost. They’re more expensive than suction-side or pressure-side cleaners (unless your pressure-side cleaner requires a booster pump), and cost more to repair should anything go wrong. Our recommendation is to buy a high-quality robotic pool vacuum with a good warranty. This device functions similarly to a manual pool vacuum. 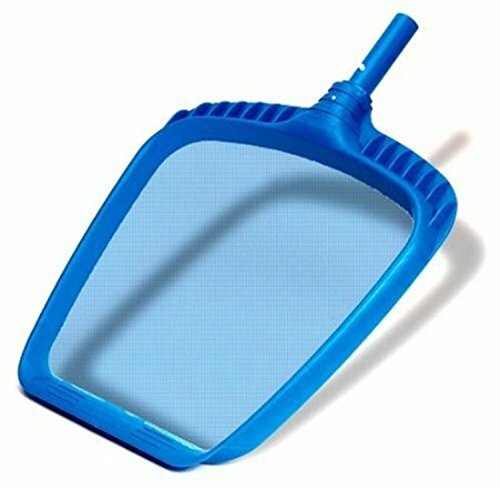 A suction-side pool cleaner attaches to your pool skimmer. As the skimmer draws in water, it creates a siphon to your filter system. For this reason, we don’t recommend suction-side cleaners. The potential damage to your filter should the cleaner pick up something like a rock isn’t worth the risk. Conversely, this device works to clean the pool with the help of the water coming from your filter system. A pressure-side cleaner If you click this link and make a purchase, we earn a commission at no additional cost to you. attaches to your return jet, and creates a water vortex that pushed debris into a mesh bag. Once the pool’s clean, you just have to empty the bag. While this isn’t as risky to your filter system as a suction-side cleaner, it’s still not as effective or ideal a solution as skimming and vacuuming your pool to keep as much debris as possible out of your filter in the first place. Additional Pool Cleaning: You’re Not Done Yet! Cleaning the pool is only half the job. After you go to all the trouble to skim, brush, and vacuum your pool, what’s the last thing you want? A bunch of leaves, dirt, and other debris to make its way into your water because you neglected to clean the deck and the filter. Don’t let all your hard work go to waste. Just spraying or sweeping is good enough most of the time. 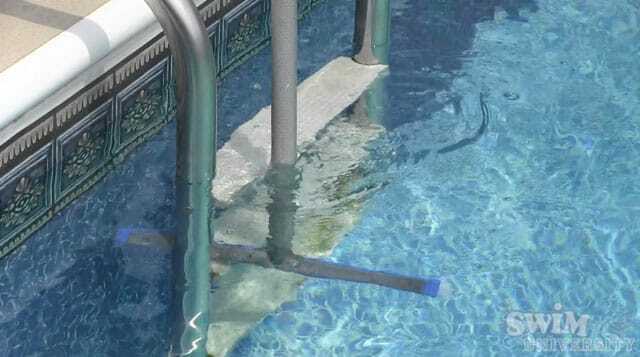 But keeping your pool deck clean isn’t only about removing visible debris. In addition to cleaning it, you’ll sometimes need to disinfect it. Even if you use sanitizers in your pool to keep the water clean, those chemicals dissipate over time, which is why you need to add them on a regular basis. And once the water is out of your pool and onto your deck, the sanitizing chemicals will not only dissipate, but evaporate, meaning your deck can become a breeding ground for bacteria and even algae. Let it go long enough, and those kinds of growths can become slippery, which means your deck isn’t just dirty, it’s dangerous. For cleaning and disinfecting, you have a couple of options. You can buy a special pool deck cleaner If you click this link and make a purchase, we earn a commission at no additional cost to you. , which usually comes in a liquid concentrate. Or you can use trisodium phosphate If you click this link and make a purchase, we earn a commission at no additional cost to you. , which is a water-soluble powder. Whatever cleaning solution you use, follow the manufacturer’s instructions because how much you use and how you apply it may depend on the material your deck is made of. Once the solution is mixed, you can usually just scrub the deck with a long-handled, stiff-bristled brush If you click this link and make a purchase, we earn a commission at no additional cost to you. .
Of course, if you have a large deck, hand-brushing it could take you all day. 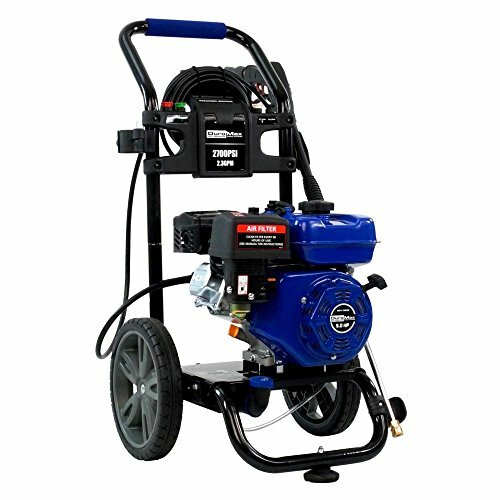 To make pool deck cleaning really easy, consider investing in a pressure washer If you click this link and make a purchase, we earn a commission at no additional cost to you. . Or you can just use a high-pressure nozzle If you click this link and make a purchase, we earn a commission at no additional cost to you. on your garden hose. 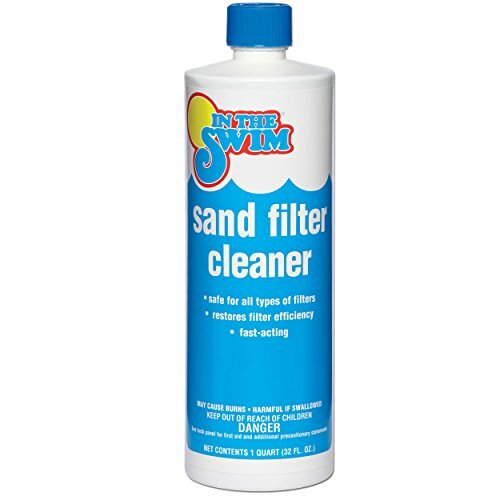 No matter how much you skim, brush, or vacuum, if your pool filter is dirty, your water is dirty. The method you use to clean your pool filter will depend on whether it’s a D.E filter, a cartridge filter, or a sand filter. Regardless of the type, clean your filter If you click this link and make a purchase, we earn a commission at no additional cost to you. on a regular basis, and keep an eye out for debris between cleanings. You’re Ready to Clean Your Pool Like a Pro! We don’t have to tell you what a bummer it is to be all ready to swim only to find the pool full of leaves, and not have a skimmer net handy. Now that you know what you need to keep your pool and its surrounding area clean, you can make sure you have the right tools and chemicals on hand so your pool is always clean, ready, and waiting for you.